WASHINGTON — Deepening tension between congressional Republicans and the Justice Department erupted in full public view Thursday, as a senior FBI agent sparred with lawmakers who suggested his bias against President Trump tainted the department’s Russia investigation. Peter Strzok, the senior FBI official who oversaw the Hillary Clinton email investigation and helped lead the initial probe of ties between Russia and the Trump campaign strongly rejected claims that personal political views he shared with a colleague affected his official actions, while accusing Republicans of furthering Vladimir Putin’s goal of sowing discord in the U.S.
“I have the utmost respect for Congress’s oversight role, but I truly believe that today’s hearing is just another victory notch in Putin’s belt and another milestone in our enemies’ campaign to tear America apart,” he said at a joint hearing of the House Oversight and Judiciary Committees, who have been jointly probing the Justice Department’s handling of both probes Strzok helped lead. But Republicans relentlessly questioned Strzok over some of the thousands of text messages he exchanged with Lisa Page, counsel to then-FBI deputy director Andrew McCabe, in which the two were critical of then-candidate Trump. “We’re not even a week into an investigation that you originated, approved, were the contact for, you hadn’t interviewed a single solitary soul until August the 11th, and you’re already promising to protect the country from that menace Donald Trump,” Gowdy said. In his opening statement Strzok acknowledged making “blunt” comments about Trump and other political figures, and expressed regret. Responding to Gowdy, Strzok said messages such as that one were “written late at night, off-the-cuff,” and reflecting his immediate views about news of the day. Strzok noted that he was one of a very small number of people with knowledge of the fact that the FBI had launched a counterintelligence investigation involving the Trump campaign. “This information had the potential to derail, and quite possibly, defeat Mr. Trump. But the thought of exposing that information never crossed my mind,” he said. Democrats largely used the hearing to attack Republicans for what they described as a coordinated effort with the White House to delegitimize the Russia probe now led by special counsel Robert Mueller. “Accountability is coming one way or another, and they are scared and are trying to undermine the investigation,” said Rep. Jerry Nadler, D-N.Y., the top Democrat on the House Judiciary Committee. The more than 40,000 text messages exchanged between Strzok and Page, who were engaged in an extramarital affair, have been held up by Republicans as a prime example of political bias that infected the Justice Department and reflected animus against the Republican candidate. Trump has often tweeted about Strzok and Page as an example of what he has called a “witch hunt” against him. House Judiciary Committee Chairman Bob Goodlatte, R-Va., who accused Strzok of “turn[ing] our system of justice on its head,” asked Strzok about another message in which he wrote he had just come from a Wal-Mart and could “smell” the Trump supporters. “You don’t think that it was the bias expressed in your text messages that caused Mr. Mueller to remove you from the investigation?” Goodlatte asked. 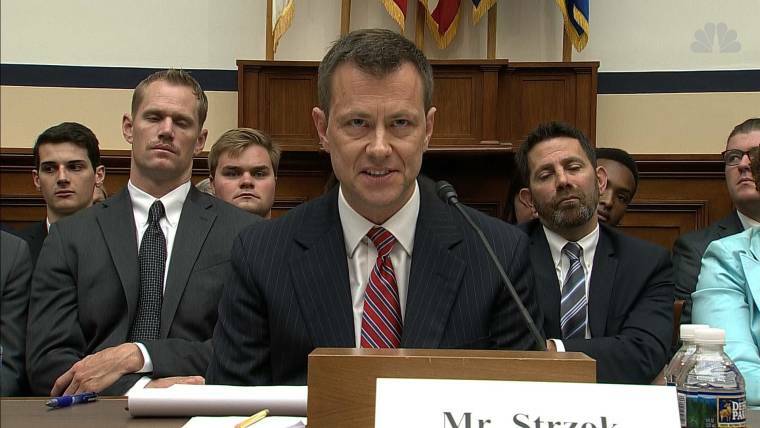 “I do not think that … bias was expressed in those text messages,” Strzok replied. Rep. Louie Gohmert, R-Texas, at one point called Strzok “disgraceful,” accusing him of lying to the committee under oath and even raising his extramarital affair. “I can’t help but wonder when I see you looking there with a little smirk, how many times did you look so innocent into your wife’s eye and lie to her,” Gohmert said, prompting howls from Democrats at what they called an “outrageous” comment. Strzok was removed as a member of Special Counsel Robert Mueller’s team one day after Horowitz team disclosed to him the existence of Strzok’s anti-Trump texts. 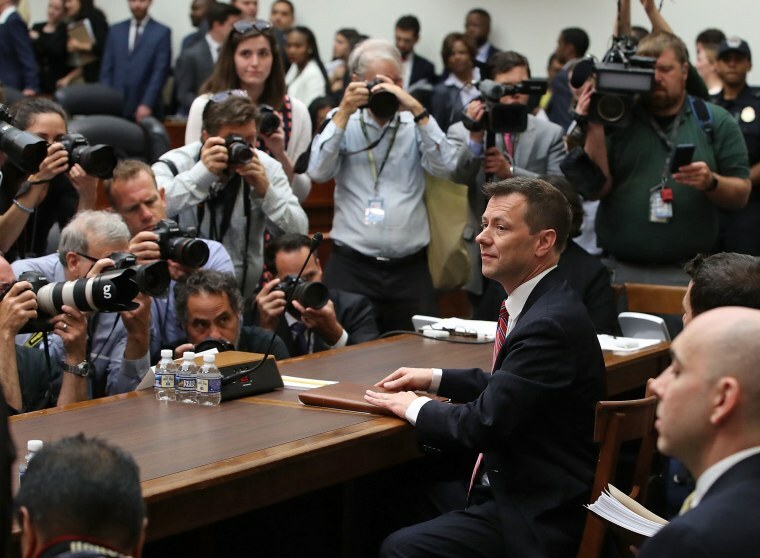 Strzok had already appeared before the same committees in June for a closed, 11-hour interview with the same congressional committees. Democrats tried unsuccessfully to force Republicans to release the transcript of that interview, which they said included many of the same questions being asked publicly Thursday. “Although we found no documentary or testimonial evidence directly connecting the political views these employees expressed in their text messages and instant messages to the specific [Clinton email] investigative decisions we reviewed … the messages cast a cloud over the FBI investigations to which these employees were assigned,” he concluded. Page, who initially defied a subpoena from the House Judiciary and Oversight Committees to appear for a closed interview Wednesday, is now expected to appear before lawmakers Friday.